Join us on our next field trip and see what you've been missing. 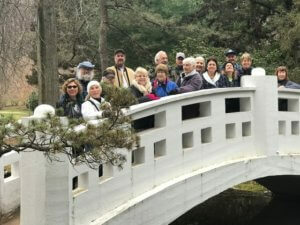 Most of our trips are free and open to the public, and beginners are always welcomed. Main entrance at the end of the guard rail. 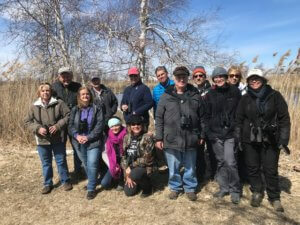 Search for residents and the migrants and breeders of early spring in the many habitats of this beautiful and compact preserve. The trail follows sections of the Hockanum River and butts up against the Manchester Landfill at times. Forest, meadow, wetlands and sections of Hop Brook will provide a diversity of bird species. Visit open fields, and a woodland trail with a slight incline. It can be wet on this 2-mile loop. Nice mix of plants and birds. Enjoy a morning trip exploring Quarry Park and the Connecticut River floodplain in the Rocky Hill area. Wear sturdy shoes, and if the spring has been wet, bring waterproof boots. Spend the morning on an easy walk looking for migrants on MDC property along the West Branch of the Farmington River. Look for migrants and other birds in a variety of habitats. Gay City has tall trees, wetland ponds and an interesting history. Tanager Hill and the adjacent Owen-Mortimer property provide over 100 acres of spectacular birding habitat on Talcott Mountain. This morning two-mile walk ascends over 200 feet. Fight bugs and walk hillside trails on this Lyme Land Conservation Trust park. Last year 48 species were seen: both Waterthrushes, Blue-winged, Prairie, Blackpoll, Cerulean Warblers, and Raven. Overnight trips: For any overnight trips, the leader must be contacted two weeks prior. Weekday walks: Please check the website and HASnotes for field trip announcements. Note: Please inform the leaders if you plan to join the group. Pouring rain generally cancels a trip, but it may not be raining at the trip site, so call. Attendees are responsible for their own meals, travel expenses and accommodations, when applicable. Please check the website for any changes to field trip dates due to weather or other circumstances. Members and non-members can email us at info@HartfordAudubon.org for further information or assistance. You may also contact the trip leader listed for a particular trip via email or phone. 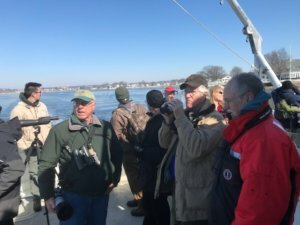 Reminder: The Hartford Audubon Society Board would like to encourage its members and guests to take seriously the goals of this organization to promote conservation of our natural resources and car pool whenever possible.